When Teak is lonely she travels to the imaginary world she has created filled with fascinating characters. This insightful book explores a child's instinct to use imagination to offer comfort and deal with anxiety. Teak is travelling with her parents across Europe between the two World Wars. With no friends and her parents often working, she is very lonely. To comfort Teak when they are apart, her mother tells her that they can meet in the imaginary world Teak has created called Beejumstan. Teak's travels to this magical realm bring her face to face with Lonesome, a well-attired rabbit; Figg Newton, the alchemist; the witches Rudintruda and Idy Fix; Gezeebius, the Wise Old Man; and many other fascinating characters. Through this enchanting tale, Alice O. Howell suggests that within us are many worlds as real and compelling as the one we know outside. Partly autobiographical, The Beejum Book explores a child's instinct to use imagination to offer comfort and deal with anxiety, an impulse that we can all be inspired by. 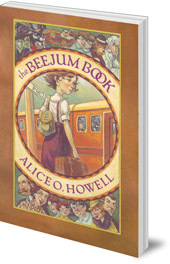 Alice O. Howell (1922-2014) was born in Cambridge, Massachusetts. By the age of eighteen, she had lived in or travelled to thirty-seven countries. She graduated from the Buser Institut in Switzerland before returning to the US. She studied Jungian depth psychology and astrology for thirty years and was the author of seven books, including two books for children, The Beejum Book and Lara's First Christmas. She died just shy of her 92nd birthday.